We are proud to announce the continued support of Mount Pleasant Group with a donation of $6, 000. 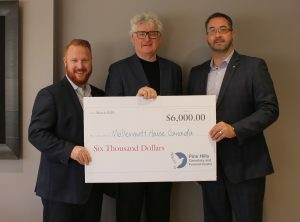 The funds will go towards Phase 2 and 3 of the Palliative Care Unit at Sunnybrook Health Sciences Centre which will see the refurbishing and restoration of the nursing stations and all of the patient rooms. Mount Pleasant Group understands the importance of Hospice Palliative Care through their work with 39 Hospices. HCPO Mount Pleasant Group’s Prospect Cemetery is where Canada’s “Field of Honour”, Canada’s first veterans section, was created. The Field of Honour is the final resting place for 300 Canadian and Allied Forces veterans; it is the largest first World War veterans section in Canada and to commemorate the 100th Anniversary of the First World War a series of bronze plaques were mounted on its west side. These plaques detail Canada’s involvement and the roles of Canadian Soldiers in battles such as Somme, Vimy Ridge, Ypres, Beaumont-Hamel and Passchendaele. The plaques also explain the reason for war and the growth and nationhood that followed. Prospect Cemetery is not alone in its memorial for Canada’s brave soldiers, Mount Pleasant Group’s York Cemetery unveiled the only memorial in the country for all 99 recipients of The Victoria Cross on June 25, 2017. The British Victoria Cross was instituted in 1856 by Queen Victoria to honour “most conspicuous bravery or some daring or pre-eminent act of valour or self-sacrifice, or extreme devotion to duty in the presence of the enemy”. Mount Pleasant Groups community involvement with end of life care and dedication the honouring Canada’s veterans is exemplary of McDermott House Canada’s dedication to serving those who serve.